In the Missing column of the SPSS Variable View tab, you can specify what is to be entered for a value that is missing for a variable in a case. In other words, when you have values for all variables in a case except one, you can specify a placeholder for the missing value. Select a cell in the Missing column. Click the button with three dots and the Missing Values dialog box, shown here, appears. You can specify exactly what is entered for a missing value. For example, say you’re entering responses to questions, and one of the questions is, “How many cars do you own?” The normal answer to this question is a number, so you define the variable type as a number. If someone chooses to ignore this question, this variable won’t have a value. However, you can specify a placeholder value. Perhaps 0 seems like a good choice for a placeholder here, but it’s not really — lots of people don’t have cars. Instead, a less likely value — like, say, –1 — makes a better choice. A very popular choice among SPSS users is –9, but this will depend on the values of the original variable. If you specify that a value is representing a missing value, that value is not included in general calculations. During your analysis, however, you can determine how many values are missing for each of the different reasons. 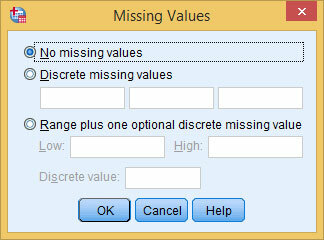 You can specify up to three specific values (called discrete values) to represent missing data, or you can specify a range of numbers along with one discrete value, all to be considered missing. The only reason you would need to specify a range of values is if you have lots of reasons why data is missing and want to track them all. One of the many reasons you don’t want to abuse the string type is that it makes a mess of missing data or incorrect data. If Female and Male are strings, you can get entries like “m,” “M,” “Male,” and even crazy unexpected ones like “H” and “mail.” You’re better off doing what all experienced users do: Use numeric codes with values!